One place I knew I always wanted to visit was the retail showcase of Caspari. I have long admired their website and products sold locally. They were in Virginia, but when would I ever be there? Low and behold they are located in the same town as Monticello, Charlottesville! We spent part of a day there on our vacation and the store was heavenly!! Display after display of tablescapes. I knew I wanted to share them all with you so I snapped a ton of pictures (this is only part of the store). Layer upon layer of heaven in their tablescapes. Combinations of real and paper dishes along with exciting tabletop touches made these displays divine! I loved this pink and green table with the faux flowers sprinkled around. Green and yellow with botanicals. Elegant chargers with linen napkins and paper plates and lettered napkins (yep those are paper floral plates!). I was a fool - literally squealing with delight at each table. the sales person was very friendly. I will share the rest of the store with you later, but I hope you enjoyed these table tops. I'm joining Susan at Between Naps on the Porch today. How beautiful! I love the pink and green one especially. Caspari is the most elegant of paper products for the table. What fun! There is so much inspiration here! Thanks for sharing it with us. I had never heard of Caspari, but they have beautiful stuff. I went to the web site, too. Eye candy! I love all the great ideas! What a great shop. Thank you for bringing it to us. I wish I could see it in person. Wow! these are amazing! 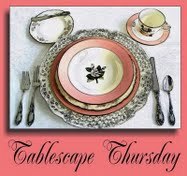 Thank you for sharing such great tablescapes. Beautiful displays, love the green and pink. Have a great weekend! LOL! Husbands just don't get it, do they? I know you had a blast getting to see so many pretty tables in one store! What fun! Thank you for doing this photos for us. I have never heared of Caspari, but that says nothing, because I am in Germany. What an inspiring store, I could stay there for a week and look at all those pretty tables. Thank you for sharing and have a nice weekend.